Recycling: what's in your dustbin? Sorting household waste for collection and recycling. 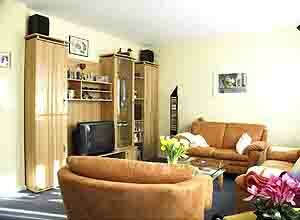 How your home can be more environmentally friendly? 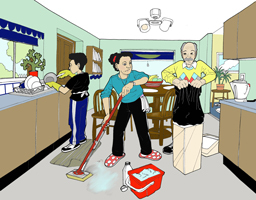 In this section pupils learn to talk about what sort of building they live in, the rooms they use, and how they can save energy at home. 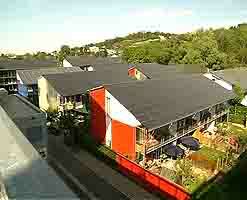 They will also look at different materials, household waste and recycling. Researchers from a Hamburg-based ad agency scoured all the statistics and interviewed sample families before building the 'typical German living room' in their offices - to help them understand the families they are selling to. 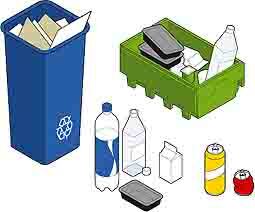 Recycling - what's in your dustbin? The familiar story of the "Three Little Pigs" is all about selecting materials that are appropriate to the task. 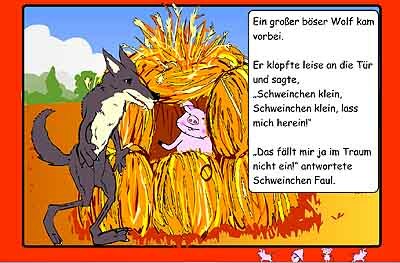 One class looked at the story in German, from the Northumberland Grid for Learning - using the downloadable A4 book and Resource Pack. (RIGHT) One of the little pigs builds a house of straw.